RUSH: Meeting and surpassing all audience expectations every day. 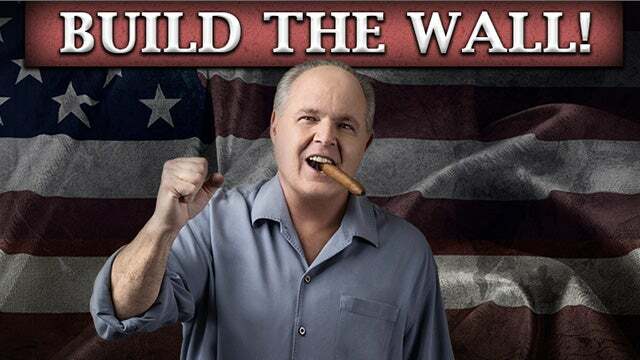 I am Rush Limbaugh, America's Real Anchorman, doing the job that the Drive-By Media is thought to do. A household name in all four corners of the world. Telephone number if you want to join us, 800-282-2882. The email address, ElRushbo@eibnet.us. The president tweeted about this Democrat position here on negotiations on some kind of new border security, a wall, what have you. And he's very clear about it. RUSH: He's right. The Democrats are hanging -- I mean, they are forcing a shutdown or they are trying to. They do not want to detain or send back criminal aliens! They don't want to give an inch on this. They don't want to negotiate, participate in anything. And don't think that Trump wasn't aware of this two and a half weeks ago when he made this proposal. Washington Post: “Shutdown Looms As Border Talks Break Down Over Immigration Enforcement - The nation faces the real possibility of another government shutdown at the end of the week after bipartisan talks aimed at averting that outcome broke down in a dispute over immigration enforcement, lawmakers and aides said Sunday. That's very clearly the case. A cap on the number of violent felons that we can detain. The Democrats want to limit that number. We're are there at the number that we want the upper number to be, so we're looking at release! Democrats are advocating for the release of convicted, violent felons to not be detained. And they're aiming for a shutdown for all of the political reasons, even as Trump is sitting there today with 52% approval. Now, the Gallup polling unit has put out a little think piece here. They have a blog at the Gallup company website, and it's called The Chairman's Blog. And the headline of this little post is: “ What If There Were 42 Million at the Border? ” What if, instead of these caravans of 10,000, 15,000, what if there were 500,000 people in these caravans? What do you think the national attitude would be about it? 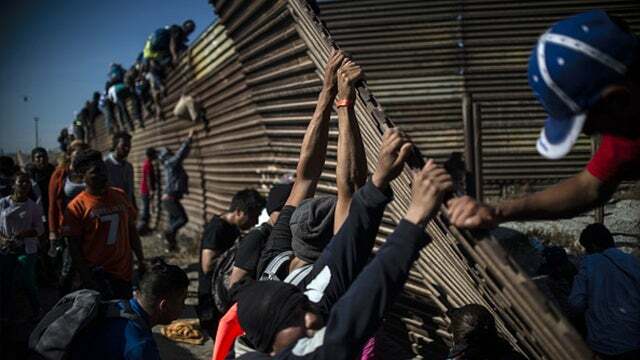 If you had 250,000 people amassed at the border, what do you think the majority opinion in the country would be about letting them in? Well, interestingly, The Chairman's Blog at Gallup incorporated some polling data into a point here. What they did, they asked the whole population of Latin America if they would like to move. There are 33 countries in Latin America and the Caribbean, 450 million people, adults, 450 million adults live in the region, Latin America and the Caribbean. So Gallup went down there and asked them, "Would you like to move to another country permanently if you could?" Twenty-seven percent of 450 million said "yes." That's 120 million people. Our population is just north of 300 million, 120 million people in Latin America and the Caribbean said yes, they would like to migrate somewhere. So you know what the next question was. Where would you like to move? And of that 120 million who said they would like to move to America, 35% said they want to go to the United States. That number is 42 million, 42 million people in Latin America and the Caribbean say they want to move to America. Now, I would guess that a number of people taking this poll did not answer honestly because they thought they might be targeting themselves, and if they say they want to move to America, then they might be watched because America doesn't want them. Who knows their thought process. I'm just telling you, I'll bet it's a lot more than 42 million people in Latin America who want to come to the United States. Hence the question: "What If There Were 42 Million at the Border?" Because essentially there are. If we have polling data that everybody in Washington's gonna sign onto and believe, 42 million people -- in Latin America alone -- in Latin America and the Caribbean say they want to move to America, Pshew! Folks, if that became the number that everybody was thinking about, what do you think immigration policy would become? And what would be the politics of it? Can you imagine the Democrat Party saying, "Sure! Forty-two million people? Let 'em in!" Can you imagine them say that, politically? Some of you, I'm sure, can. What would be the politics do you think, the political impact of saying, "There's no way we can absorb 42 million people, especially when none of 'em are gonna assimilate, when they're not gonna become Americans, when they're gonna be essentially coming in illegally," because that's the question. Are we gonna stop this? If 42 million say they want to move to America, we've gotta be prepared to deal with a number very close to that, do we not? If we have a policy that basically shouts "open borders" to the rest of the world, what will be the likelihood that many of that 42 million will give it a shot at some point? There you have, in a nutshell, the Democrat Party position on this. They look at that 42 million not as all at once but over the course of many years, and they see it as a godsend. It's 42 million people that they think... Even if they can get just 60% of those as voters, then they would be looking at what they think would be perpetual power. Anyway, it's a situation that's gonna have to come to a head at some point, somehow. I'm gonna tell you that I think Donald Trump is gonna prevail. I think he's going to win big on this because he has in most else. He's not got a clean sweep of a record here, and he's got the continuing negative press, and his victories are not touted as victories. I know the drill on that. But in terms of more and more Americans noticing, more and more Americans... There's another poll. A record number of... What is it? Hang on just a second. Real quickly. It goes along with the 52%. Yeah, it's at Gallup. We have a 16-year high in optimism about personal finances. In a Gallup poll asking people about their financial future, we have a 16-year high in optimism. We have Trump at 52% approval. Look at the all the other great polling -- not polling, statistical data. Unemployment. African-American and Hispanic unemployment. I mean, there is so much good that is going on, and if there were a Democrat in the White House with this kind of economic activity, it's all anybody would be hearing about. But there wouldn't be this kind of economic activity with a Democrat in the White House, as we know after eight years of Obama.